Get Vendio Gallery - Now FREE! 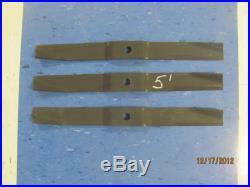 Hours 7:30 to 5:00 EST M-F. Up for sale is (1) SET OF 3 REPLACEMENT BLADES FOR 5' FINISHING MOWERS. Cutting tip to cutting tip is 20-1/2 long. This is a list of OEM blade numbers this blade replaces. WHEN SERVICING YOUR MOWER ITS ALWAYS A GOOD IDEA TO HAVE SPARE PARTS ON HAND SO WHEN YOUR PURCHASING THE BLADES ITS GOOD TO REPLACE THE BELTS AS WELL. This is also the blade for the caroni TC910 and the Techma, it just takes 5 blades instead of 3. We carry blades, belts, spindles, wheels and forks, gearboxes and everything else for these mowers. If you have not turned your problems over to JESUS CHRIST start doing so today! Sellers: Add a FREE map to your listings. The item "SET OF 3 5' OEM FINISHING MOWER BLADES, CARONI 59006200, MASCHIO T14004010 -60" is in sale since Wednesday, October 05, 2011. This item is in the category "Business & Industrial\Heavy Equipment Attachments\Mower Decks". The seller is "gaequip" and is located in Swainsboro, Georgia. This item can be shipped to United States.